I was >> here in Minneapolis last week for the Midwest Booksellers Association Trade Show. It was great connecting with so many terrific independent booksellers. I can't thank these dedicated, delightful people enough for all they do to hand sell books in this tough economy and ever-changing industry. It was a real joy to be in the same room with so many passionate book people on Thursday. Thanks MBA and Simon & Schuster! What a fun surprise to find myself seated at a table with a Facebook friend I'd never met - Cynthia Compton from 4 KIDS BOOKS & TOYS in Indiana! I channeled my inner CRAFTY CHLOE and made these ZOMBIE IN LOVE table favors for the Moveable Feast. 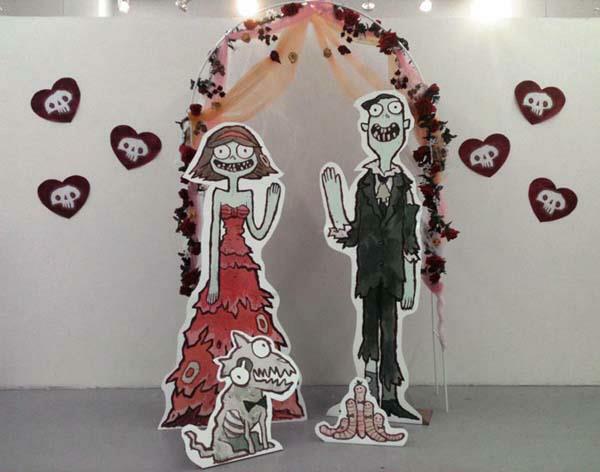 Don't miss this awesome ZOMBIE IN LOVE art exhibition at Gallery Nucleus!